This spring, Wimbledon College of Arts Costume graduates, Charlotte Cameron and Viviane Chen, worked on a Heritage Lottery funded project to photograph over 300 original items from The John Bright Costume Collection in conjunction with Cosprop. Working closely with the collection, which comprises thousands of historic garments and textiles belonging to the award-winning costume designer John Bright, the graduates learned professional costume mounting from Gesa Warner, the costume mounter for the Victoria & Albert Museum (V&A), and gained valuable insight into historical costume construction from the 18th to the 20th century. “I was first contacted by Rosa Fernández-Day, the Project Manager behind The John Bright Collection. Elizabeth Dawson, my tutor, had suggested to her that some Costume graduates might be interested in the project,” says Charlotte. 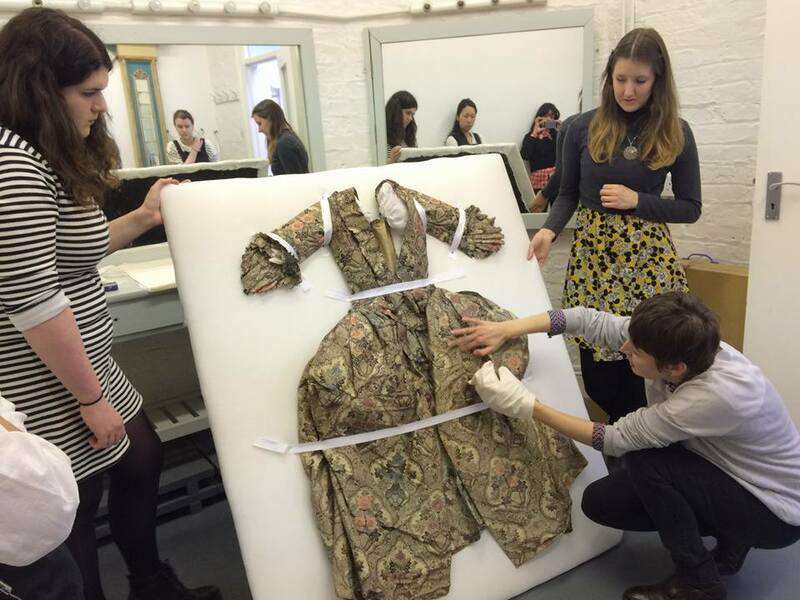 The graduates underwent three intensive training days with Gesa Warner of the V&A where they learnt how to mount a costume, pad mannequins and handle fragile historical garments with care. “She taught us the basics of costume mounting and supervised our work throughout the project. 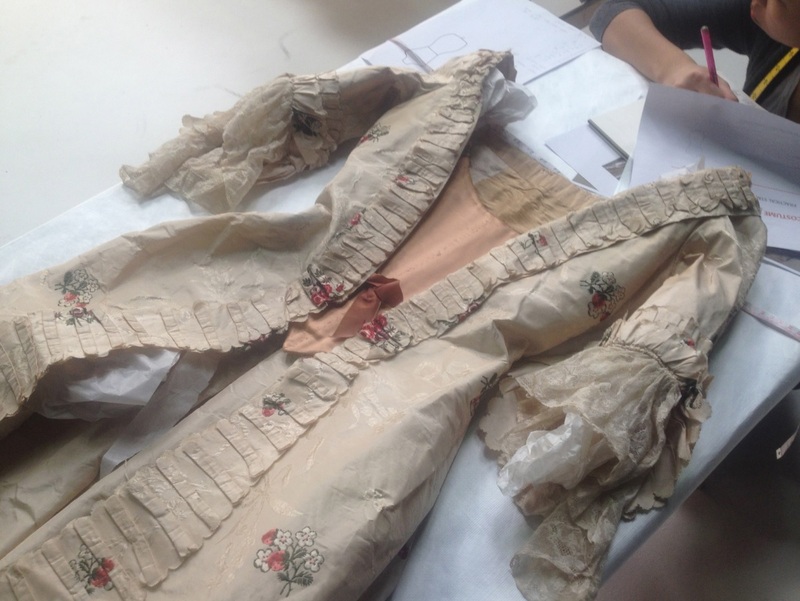 For the training, we worked in pairs and fellow Costume graduate Viviane Chen and I worked on a mount for a cream 18th century sack back dress. The training taught us how to handle fragile garments and mount them in a way that causes the least strain to the object,” explains Charlotte. 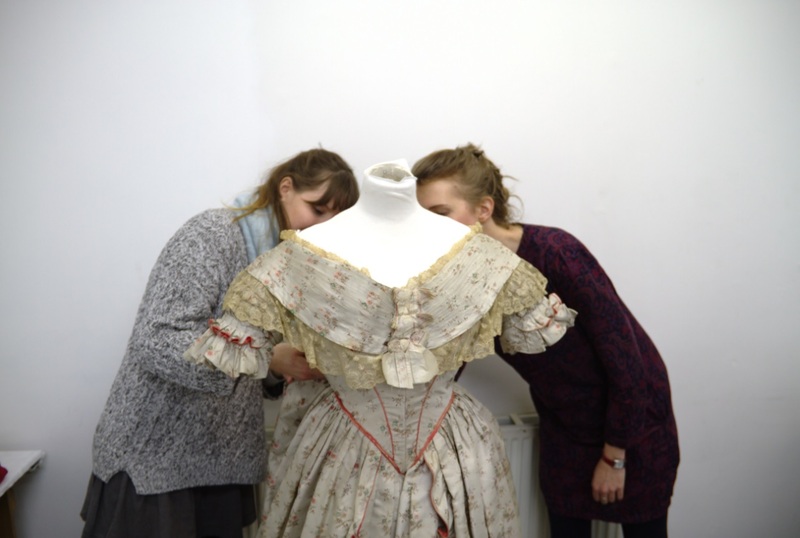 Charlotte volunteered on The John Bright Collection project for a few days a week throughout the duration, until the photography of over 300 garments was completed. “I had some previous experience of costume mounting, but nothing on this scale, so I really learnt a lot from Gesa Warner,” says Charlotte. Project Manager, Rosa Fernández-Day was extremely impressed with the skill and work ethic of the recent graduates who assisted with the project. “Cosprop was extremely lucky to count on the support of Wimbledon College of Arts for this Heritage Lottery funded project. Our goal was to photograph over 200 original items from The John Bright Collection in six months and to museum standards. Aware of the challenge, the Wimbledon graduates that volunteered with us were extremely committed, hard-working and enthusiastic. And thanks to their previously acquired technical skills, history of dress knowledge and positive disposition, they soon became key members of the team,” explains Rosa. Charlotte is already putting her new skills that she learnt from working on The John Bright Collection project to use in a number of other jobs. “I realised during my studies at Wimbledon that I was particularly interested in historical costume collections and museum exhibitions. It was during my work placement, in the second year of the course, working on the mannequins for Kitty & the Bulldog at The V&A Museum Textile Conservation Department that I realised how the practical skills I was learning could be applied to working with these types of collections,” says Charlotte. Charlotte enjoyed her time studying BA Costume Interpretation at Wimbledon College of Arts and credits the course with giving her the skillset needed to work on projects of this scale. “There were many things I enjoyed about the course, but obviously having the opportunity to learn from tutors and costume professionals was invaluable. Milliner Sean Barrett and dye technician Viv Philpot in particular were so encouraging and had many creative ideas to help us on our third year projects,” say Charlotte. Charlotte recommends studying the Costume course at Wimbledon College of Arts and offered her advice to future students and those about to graduate. 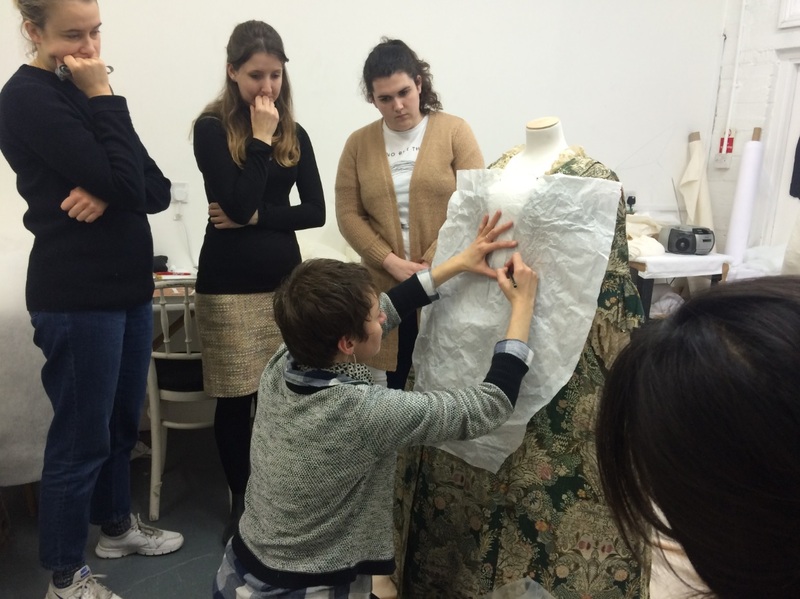 “The course will give you a good base of knowledge of how to make costumes and the context of fashion history. It’s great if you can find what aspect of costume making you particularly enjoy during your studies. Try to work in the studio space as much as possible so that you can speak to your tutors and to other students when you encounter something that you’re unsure about. Ask your tutors about how to find work in the particular area you’re interested in and whether they know of any contacts, whether this be in theatre, film or with historic collections,” she explains. In September this year Charlotte will be starting her M.Phil. Textile Conservation at Centre for Textile Conservation, University of Glasgow. “I’m really pleased to have gained a place and am looking forward to finding where this new direction will take me,” she says. Learn more about studying BA Costume for Theatre & Screen at Wimbledon College of Arts.